Today began, like most, with a trip to the hospital to visit the boys in the NICU. Actually, that's a lie. The nurses gave Jen explicit instructions to get a good night's rest and not rush in early. For that reason, on this Bastille Day, we fittingly began the day with a breakfast viewing of the Tour de France where we got to watch some hot cycling action while answering Lauren's questions about the sport of cycling. After that we headed to the hospital. The nurse did a presentation using Martin as an example. She showed us how to bathe the babies, wash their hair, and how to take their temperature . . . the accurate way. Above is a picture of me taking Elliott's temperature. He took to it a lot more gracefully than his brother. After that I gave him a bath, washed his hair, and did an incredibly poor job of combing his hair. Martin flipped out during all of his bathing, temperature-taking, and hair-washing. Elliott seemed to give me an easy time. The whole time I was going through all the motions he was eying me as if to say, "You really don't know what you're doing, do you? Okay. I'll be easy on you until you get the hang of this." It is really convenient that we have two babies because the nurse can use one baby (the lucky one) as a demonstration baby and then I can use the other (the unlucky one) to practice. How do people with one child learn how to do all this stuff? After that we were able to take the guys out of the NICU for the first time into the room right beside their mothers' room for a photo shoot with one of the hospital photographers. While she was snapping away I was taking poorer versions of the same pictures with my camera. After getting home, napping, returning to the hospital to drop off milk, and grocery shopping with Lauren while Jen stayed behind, we had a huge dinner of leftovers. 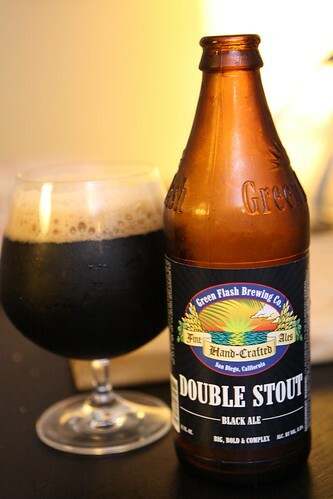 Afterwards I poured out this Double Stout by Green Flash Brewing Company. It was a very nice stout. I'd been looking forward to having it and it was the perfect way to end the day. It could only have been more perfect if we had watched Back to the Future. Oh wait, we did watch Back to the Future! Tomorrow it looks like the guys are coming home. It has been a nice transition but we'll soon see exactly how much our lives have been changed forever.